India is a land of villages which are inhabited mostly by famers. This is because India is essentially an agricultural country. The majority of the populations are farmers. The farmer is usually sun-burnt, strong and sturdy. His work is very hard. He gets up at cockcrow and leaves for his field after a simple meal. In the field, he has a lot of work to do. He has to plough, weed, sow, check the crops for pests or crop and thresh the grain. Long experience has taught him what to do and when. His wife brings him his mid-day meal. He sits under a shady tree and eats heartily. After a short nap, he resumes work, which continues until sunset. Then he returns home. He unyokes his bullocks and fondly pats and feeds them. After the evening meal, he relaxes by chatting with neighbours and friends. The day’s experiences and problems are discussed. Then he goes to bed. Honest and hard labour gives him a good night’s sleep. Thanks to government policies, the farmer’s life is much better today. Still, he lives a hard life, sometimes finding it difficult to make both ends meet. If there is drought or excess rains, the crops fail. Then life is really hard for the farmer. When we sit down at the table to eat, we rarely think of the farmer. 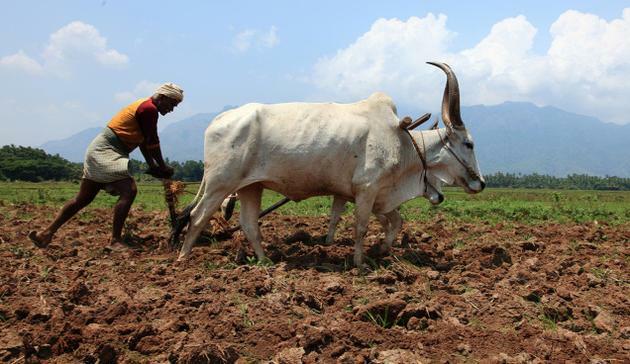 The rice, the dal, the pulses, and the vegetables-all these come to us due to hard work of farmer. Let us gratefully acknowledge the indispensable services of all farmers to the nation. Just planting a plant, is not a solution, if we plant a plant and did not care it all, then the plant/ tree will die. Farmer is the only responsible person who take cares of plants. What we eat today, or we get from the market is just because of farmer hard work. Their whole life is spend on the field. They worship for good rain and for the healthy crops cultivation. The government should encourage him (farmer) to use modern machines for farming and good quality of fertilizers. For this, he needs generous financial help. It is our sacred duty to prevent farmers from committing suicides. Most Indians live in villages. They are farmers. They grow food for us. They grow cereals, pulses, fruits and vegetables. Actually speaking, they are the backbone of India’s economy. But the life of an Indian farmer is very difficult. Even after working like a slave the whole day, he does not get the rewards he deserves; He gets up early in the morning and goes to his fields. He works there till evening. There is no holiday for farmers. They stuck to their fields, sows seeds, water plants and harvest crops. Quite often the poor fellow has no time for food, or rest. Even visiting a doctor in time of an aliment is a luxury for him. He works hard but lives in a mud house. He feeds others but his own family remains hungry. He eats simple food, wear simple clothes. The farmer rears cattle such as cows, buffaloes and oxen. These cattle are his valuable property.